If you are reading this article then you are probably wondering how an elderly person can defend themselves. It is true that many elderly members of our population are vulnerable to being victims of crimes, however there are measures you can take to reduce your chances of being a victim of a crime. The most important tool that you have for elderly self defense is your head. You should always try to stay alert, be aware of your surroundings and stay away from objects or buildings which may make you vulnerable to being a victim of crime. You should try not to carry lots of packages and bundles. Instead try to get your arms relatively free as you will find it much easier to repel people if you are not weighed down. You should also try to avoid carrying objects or bags which dangle down as these could be used to drag you around. Always make sure that you keep valuables such as your wallet out of sight and when you are approaching your car always have your key in your hand and always look around you so you are aware of your surroundings. It is also a good idea to carry some pepper spray or Mace in case you encounter a potentially dangerous situation. 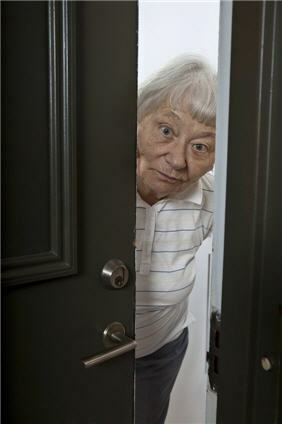 When it comes to elderly self defense and your safety at home always ensure that windows and doors are locked. You could also wedge dowels at the bottom of sliding doors and windows so that they cannot be pushed open. It is always a good idea to protect yourself at home by installing a recommended security system, and remember it is your responsibility to ensure that the security system is always armed. It is always worth keeping a cell phone or cordless phone with you so you can call for help if required and it is also a good idea to have pepper spray located at certain points in your home such as near exterior doors and by the bed. One of the most highly recommended products for elderly people is called the stun cane. The features are specially designed to be used by the elderly and you can use it both at home or when you are out walking on your own. The stun cane is a powerful and popular device as it provides both stability and acts as a self defense weapon. If you hit an attacker with the stun cane then the powerful electrical current penetrates through clothing and will cause the attacker to experience temporary effects such as immobilization, headache, pain and confusion. The duration of these effects will vary between individuals but you can use this window of opportunity to call for assistance. The length of the stun cane is usually around 34 inches so it means that you hit the attacker from a distance. It is also useful in a situation where you are being attacked by rabid dogs. Operating the stun cane is very simple as you simply need to point the cane to your target and pull the trigger when the cane is in contact with any part of the body. 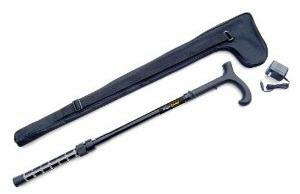 Another useful elderly self defense weapon is can self defense, not to be confused with the stun cane. You can buy specialty canes that are good for helping defend yourself as long as you take instruction classes or practice with a dvd that you can buy. Read this article for more information and using a cane to defense yourself. There are other elderly self defense tools that can be used to make your home safer, like the patio door security bar. To read more about this tool, go to our products page. In addition, you should read up on recommended home self defense products as well. Lastly, you can't go wrong with pepper spray. Read this article on recommended pepper spray products.